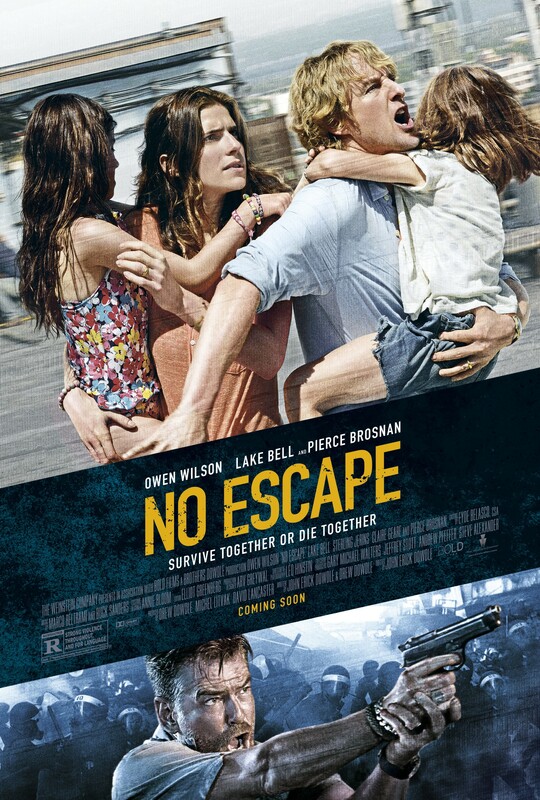 When I first saw the trailer for No Escape, I was intrigued enough to say “That’ll be one for RedBox,” and that’s precisely how I’m watching it as I write this. An action movie set on foreign soil, featuring Owen Wilson as the unlikely hero admittedly comes from more than a little out of left field, but I was still drawn to it. I rented the movie thinking it was going to be one of those turn-your-brain-off, over-the-top action flicks with a clear protagonist and villain, but it was more complex and actually packed a heavy message. Owen Wilson stars as Jack Dwyer, an American engineer who works for a water company, who moves his family to Cambodia as his company plans major construction in that country where clean water is hard to come by. He and his brood don’t have much time to settle before their hotel is overrun by armed mobs who are executing foreigners on sight. Jack’s move couldn’t have come at a worse time, as he was setting up shop in a fourth-world country that was in the middle of a coup. The movie’s title gives the sense that survival for the main characters is impossible, as without weapons or knowledge of the land, they were as good as dead. The ending of the film is unfortunately predictable, but the ride is the best part. Jack’s wife Annie (Lake Bell) is no damsel-in-distress, but rather is refreshingly strong, and even beats a man to death in a screaming rage at one point. The Dwyer gang has help from a mysterious but entertaining man named Hammond (Pierce Brosnan) who greets them not long after their arrival. Hammond is underused for much of the film, but proves to be crucial to the family’s aspirations for self-preservation. The film’s message is a worthy one, making No Escape more than a pointless, throwaway action flick. While the movie starts out like many others of this sort, depicting a foreign country as batshit crazy, it gets real with an explanation delivered by Hammond that the actions of Jack’s company are not exactly on the up-and-up, and that America is not always the good guy that it purports itself to be. All in all, No Escape is well worth the watch. The action sequences are nicely-shot and choreographed, the chaos and hopelessness of the situation in which the Dwyers find themselves is amply captured, Wilson is surprisingly believable in his role (haven’t seen him like this since Behind Enemy Lines), and the message is a tough pill to swallow, but gives the movie depth that it otherwise might not have had. If relentless action and intense violence are your cup of cinematic tea, No Escape should be on your watchlist.